As a Personal Trainer it can sometimes feel like you are a doctor needing to know a variety of medical conditions, symptoms, and treatment methods, so when someone comes to you with arthritis or a joint replacement, do you know what exercises to give them? Being a generalist in a sea of specific ailments allows us to get by, but a doctor has the ability to refer to specialists; whereas most of us trainers may refer to a physiotherapist while working alongside them. However, we can become their specialist in exercises for arthritis and joint replacement and improve our client’s recovery from knee and hip replacement surgery. Hip and knee replacement exercises is a specialization that is a growing niche. 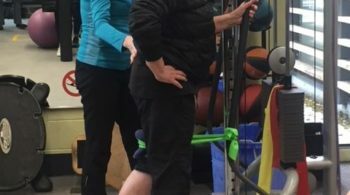 How is designing exercise programs for hip and knee replacement clients different from our everyday clients with healthy joints? First off, any one of your clients who has arthritis or is preparing for a knee or hip replacement operation, will have inflammation in the joint which may also include pain. Secondly, due to the nature of osteoarthritis and joint replacements, any client with these will have a decreased or limited range of motion. Thirdly, due to pain and changes in mobility or range of motion, there will be muscular imbalances and muscular atrophy. Lastly, every day activities, normal joint function, and stability are all impacted to varying degrees sometimes drastically. How Does Exercise Program Design Change for Joint Replacements? 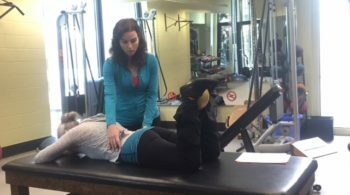 So where do you begin as a trainer selecting exercises to help your clients with arthritis and a knee or hip replacement? Think isolated and single joint verses functional and multi joint. What can happen due to prolonged pain, joint deterioration, and lack of use is that their muscles surrounding the joint can atrophy and in many cases actually forget how to fire properly. Therefore isolating specific muscles and targeting single joint exercises to start with can help them and you get the right muscles firing. Here’s another training method you could start with and that may feel really foreign to many of us due to our philosophy for function; it is isometric strength exercises. If a client comes to you pre knee replacement surgery with knee arthritis, they may have pain in specific ranges of motion or even moving their joint. This can give us challenges in trying to give them strength, but not cause pain. This is where isometric exercises can come in handy for your clients with arthritis or a joint replacement. You will need to modify your exercise program design both pre and post knee or hip replacement when your clients have swelling. As a given, every client you see with knee or hip arthritis has swelling or inflammation. Post knee or hip replacement, the inflammation will vary per client and depending on how many months post operation. Here’s a hint, inflammation does not ask for load; however gentle range of motion exercises can increase circulation and encourage healing. The best rule of thumb to follow is to use pain as your guide and our guide is to never cause or increase pain. Inflammation can be real scary for us trainers and our instinct as well as some clients instinct is to not do any exercise at all. I will share with you that it certainly was a journey in accepting we needed to still help these clients with inflammation move because the opposite may cause more harm and if we do it right, we can influence healing. Truly it was learning from the physiotherapists that it was okay to move them with inflammation and that the key is to be selective with exercise choice and monitor pain along with icing. Unilateral limb training is essential when designing your client’s exercise program who have arthritis or a hip or knee replacement. Often both pre and post joint replacement, your clients will experience a dominant leg that has taken over and supported the body while favoring the painful arthritic joint. Therefore, one leg may be stronger so selecting unilateral limb exercises ensures the weaker leg gets challenged and gains strength without the other dominant leg taking over. Another important exercise selection we need to include in our arthritis and joint replacement client’s training program are range of motion exercises. The very nature of osteoarthritis is joint deterioration and with this comes a decreased range of motion in the joint and the added inflammation also limits joint range of motion. Therefore, adding in range of motion exercises that are gentle and take your clients through their pain free range of motion are really important. These need to be done pre and post knee and hip replacement surgery and post operation there will be specific guidelines to follow. This means not all stretches or movement patterns will be safe post surgery. Make sure you learn the contraindications of exercise post knee and hip replacement. As you can see training clients with arthritis and joint replacements requires us to wear a different hat where we are thinking unique to their condition. After 20 years of training hip and knee replacement clients and running a Joint Replacement Class for pre and post surgery, I realized it truly is a specialization. That’s why I created the Joint Replacement Course for personal trainers and compiled a complete exercise program for training clients who are pre and post knee and hip replacement. 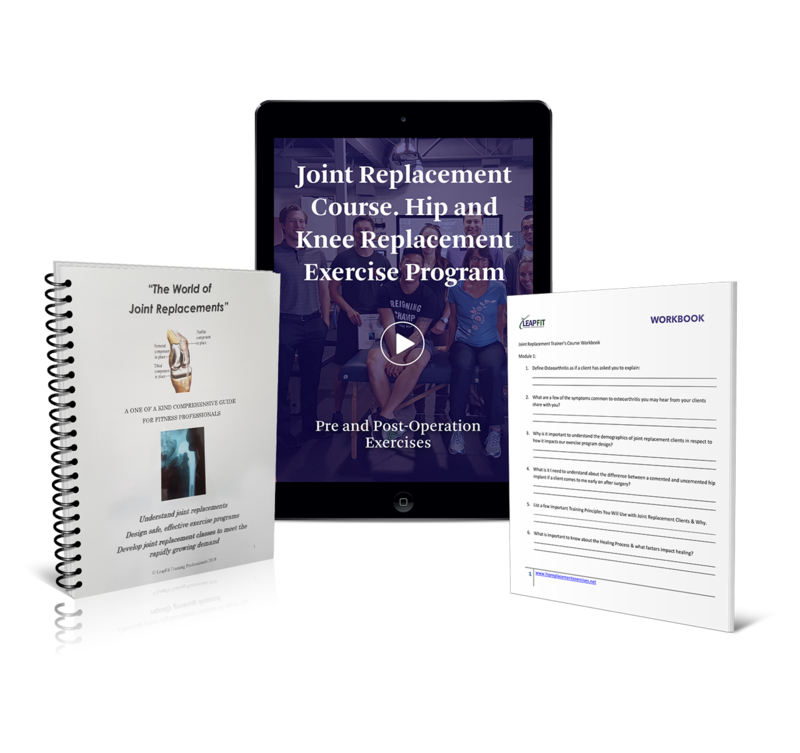 If you want to learn more about the specific exercises that are best for joint replacement clients and people with arthritis, take a look at the Joint Replacement Course here. Becoming a joint replacement exercise specialist will not only improve your clients life who have arthritis and their recovery post surgery, but it will also increase your client base as well as income. It is a niche client group that needs our help and whom we can enhance their quality of life with exercise! Let’s go build strong hip and knee joints and serve our client’s to living a great life post knee and hip replacement surgery!